Learn more about what the American Dental Association has to say about the role played by Dentists! Why does Tooth Sensitivity (Dentin Hypersensitivity) Happen? Tooth sensitivity is usually caused by dentin on root areas exposed due to receded gums or periodontal disease. Receded gums are very common and up to four fifths of people have gum recession by the time they are 65. When the root of a tooth becomes exposed it does not have a layer of enamel like the crowns of your teeth. 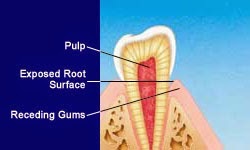 Instead the roots have a very soft covering called cementum, which once lost leaves the dentin of the root exposed. Overzealous brushing or using a very abrasive toothpaste can also cause abrasion of the tooth's enamel surface and expose dentin. A very acidic diet - for example a diet with a lot of citrus food, pickles or sodapop - can cause tooth erosion and dissolve the tooth surface, exposing the dentin. Bulimia and GERD can also result in dental erosion and sensitivity due to acid in the mouth. The best way to find out why a tooth is sensitive is to have dental professional examine you. 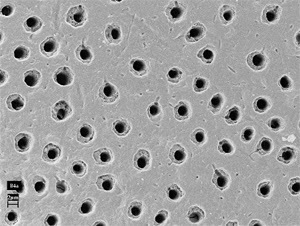 They can look for the signs of dentin exposure, and run tests to determine what the true cause of the sensitivity is. Sometimes, the sensitivity is due to a cavity or gum disease ñ these can be treated to address the sensitivity. Other times, the cause of the sensitivity is because the enamel has been lost through abrasion or erosion, or the gums have receded, causing the roots to be exposed. There are a number of treatments available, and your dental professional can help you find those that will work best, depending on your situation. Always seek a dental professional's help - do not try to diagnose this problem yourself. It may be the sign of something more serious, and only a dental professional can tell you what it really is. Learn more about tooth sensitivity by watching this video from Colgate.com. Understanding Tooth Sensitivity: Discover the causes, prevention and treatment of sensitivity. The above video was found on both Colgate.com and Colgate's YouTube Channel.